A new analyst's report is calling for calm, and pointing out that devout Apple fans will likely wait for the "iPhone 8" rather than jump ship to another device by Apple or another vendor entirely. In a note to investors seen by AppleInsider, Robert Cihra from Guggenheim notes that while it is possible that the iPhone 8 will be delayed, a "short-lived" delay will not ultimately matter to the stock. Any pent-up demand will stay with Apple, and just be shunted to the beginning of the 2018 fiscal year, and extend past the holiday buying season. Cihra still believes that fiscal year 2018, and in particular, Apple's holiday quarter will be "its biggest in three years. The firm believes that greater than 40 percent of the current install base that exceeds 700 million are now greater than two years old, more than double the number that were during the 2014 launch of the iPhone 6. Other factors boosting Apple include a tech upgrade cycle will reach out past 2018, as the firm believes that it will take up to three years to roll out OLED screens across the entire line. Furthermore, enhancing a key metric, the "iPhone 8," which will be priced greater than that of any "iPhone 7s," will further boost average selling price. The company believes that the "iPhone 8" could exceed the selling price of the "iPhone 7s" by up to $400. Cihra believes that the price jump will not be that significant, and notes that the original iPhone was also viewed as too expensive by analysts when it launched in 2007 at $499 with an AT&T contract required and attached carrier subsidies paid to Apple. Guggenheim has slightly cut its estimate for the quarter ending in September by $0.18 per share as a result of reports of iPhone delays, but is boosting the holiday quarter's earnings per share by $0.25. 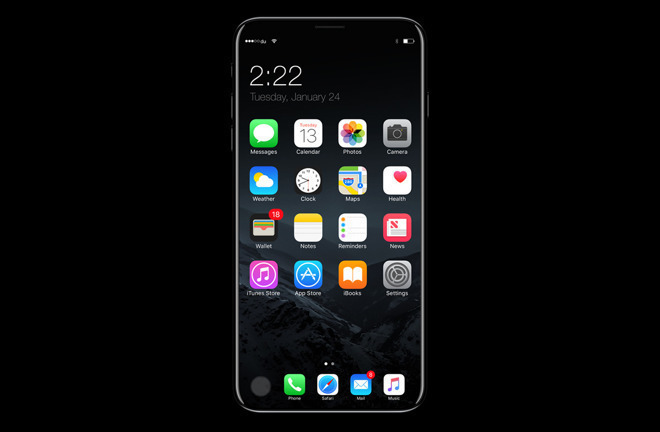 The "iPhone 8" is expected to include an edge-to-edge OLED panel with 5.1 inches of usable space, with the remainder dedicated to virtual buttons. Also expected is a larger battery in both size and capacity all encompassed within a form factor similar in size to the 4.7-inch iPhone 7. Also expected is a new 3D facial scanner. Some reports, including Guggenheim's on Tuesday, peg the possible starting price of the "iPhone 8" quite high. Early reports suggested a cost of more than $1,000, and others as much as $1,200.